On Tuesday, Phoenix played the first of two concerts in Mexico city at "Salon Cuervo", and it was absolutely amazing; it surpassed every single one of my expectations. The Paris based band gave a concert full of their all time hits focusing on their newest album Wolfgang Amadeus Phoenix. They opened magestically with "Lisztomania", hit from their latest album, which made the crowd go completely wild. Right before the last note of the song, they entwined the sounds and blasted of with "Long Distance Call", then the crowd started singing along in perfect unison. 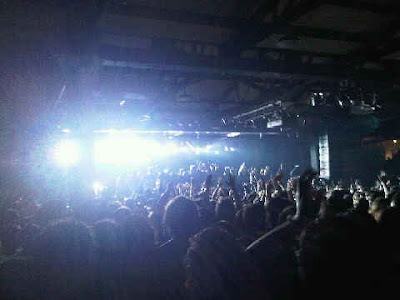 After playing songs like "Lasso", "Rome" and "Girlfriend" they ended the concert with the memorable songs "Too Young" and "If I Ever Feel Better". For the grand finale they topped the perfect performance with "1901". For this song, part of the crowd joined them on stage, and all you could feel was a vibrant buzzing feeling that almost turned into tears of joy. I am perplexed, touched and grateful for the way the band gave out its soul to the audience, reminding us that there are still great musicians out there, that are in it for the love they have towards music. Inspiring jaw dropping, downright fun; more than I would have ever expected for a not so typical Tuesday night.